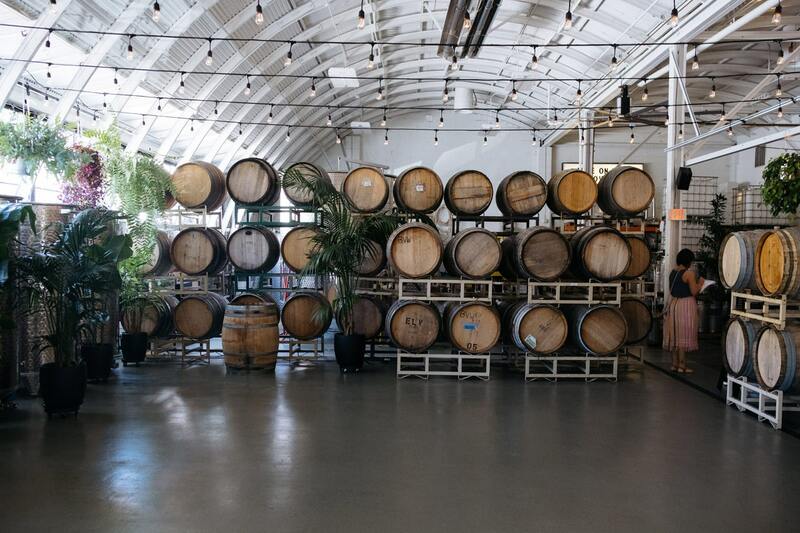 Imagine this triple threat – a winery, taproom, and uber-Instagram-worthy event space…all in one. Conveniently located in Portland, Oregon’s central Eastside, just minutes from downtown PDX – Cooper’s Hall is exactly that. Opened a little over four years ago, the 6 partners behind Coopers Hall never intended on it being an event space, but who wouldn’t want to celebrate in this refreshing space? The team of highly skilled service industry professionals collaborate to ensure weddings at their urban winery – whether small or large, are always breathtaking occasions nobody could ever forget. From sales, to planning, to execution, the team coordinates on each step of the pre-to-post event process, cultivating a sense of family to try to create a special experience for you on your big day. There are at least three sets of eyes on the event design and coordination dynamics of your event, and with in-house catering, a full bar, and staffing provided for both, you don’t have to worry about the hassle of outsourcing. There are four dedicated parking spots available to serve as a loading zone for set up/tear down, and/or shuttle area for Lyft or Uber for your guests. The building, a former auto body shop built in the mid 20th century, provides guests a spacious setting to mingle throughout an event – with room for ceremonies for 120-150 guests, and a reception capacity of 180 for a seated dinner, or 225 for a standing reception. The high ceilings of Coopers Hall provide an abundance of natural light to highlight the beautifully polished tile bar and rustic wooden barrels of the winery. 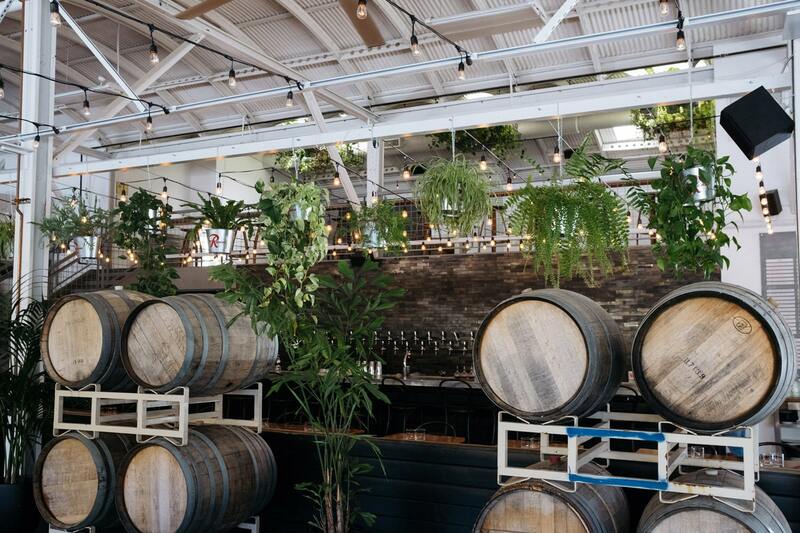 The Mezzanine, accessed by stairs, overlooks the winery and taproom, and is the ideal space for more intimate dinners or casual wedding celebrations. This area is filled with light and opulent greenery and hosts up to 50 guests standing and 40 seated. 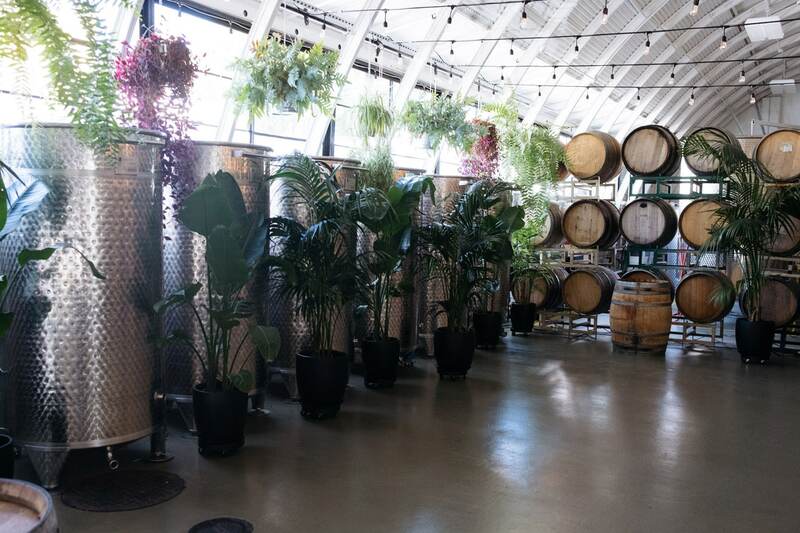 The Barrel Room, a semi-private space, is surrounded by barrels on the main floor of the production zone, offering a more industrial vibe and hosts up to 70 guests. Both the Mezzanine and The Barrel Room can be utilized in conjunction with the other areas of Cooper’s Hall for a larger gathering as well. With no distinct boundaries between the winery and tap room, Cooper’s Hall is a rare space that invites guests to get a first hand look into all aspects of the wine-making experience, from grape to bottle – or in Cooper’s Hall’s case – to tap. When we toured the venue, Shannan, the Event Directer at Coopers Hall, explained their commitment to wine on tap. “There’s such a value in kegged wine,” she stated. “It’s environmentally savvy – we’re not wasting resources on unnecessary corks and labeling, we reuse the steel kegs that the wine is kegged in, and when wine is in kegs, it doesn’t need to be aerated.” Coopers Hall has 12 of their own wines available on tap – which they produce “honestly” – there is a transparency in their process, experience, and methods. As we sat with Shannan and enjoyed a glass of wine after touring the venue, it was clear that there was a deep passion not only behind the wine, but in everything Cooper’s Hall does; from planning, to food, to creating a unique environment for guests, to event execution. This industrial, yet chic modern event space is the ideal place for a wedding “experience” that nobody will forget in Portland’s central Eastside. And we can verify…the wine is delicious! Cooper’s Hall functions as a Taproom Monday-Friday, offering restaurant service to the general public in the evenings (unless reserved for an event). The same dining experience can be enjoyed via Coopers Hall in-house catering at your wedding. Executive Chef Kieth Morris and the dedicated kitchen staff create seasonal dishes, utilizing locally sourced, sustainable ingredients. Working with some of the best farmers and vendors in the Portland area, Chef Morris curates a “culinary experience” authentic to the Pacific Northwest for you and your guests. The search is over for the instagram worthy Portland wedding venue! For more information visit Coopers Hall website.